Mr Nwanze Okonkwo, an operator, Computer-Based Test (CBT) Centre for the Unified Tertiary Matriculation Examination (UTME), Abuja, has advised applicants to strictly follow the stipulated guidelines by JAMB for easy registration. Okonkwo, also the Head, ICT, Digital Bridge Institute, an accredited CBT centre in Jabi, Abuja, gave the advice in an interview in Abuja on Friday. He said that major key requirement for registration includes creating JAMB profile using candidate’s valid email address by signing into: www.jamb.org.ng/efacility/Validateemail. Okonkwo said the next step was to pay N5, 500 JAMB fees at a bank; collect a PIN after payment; proceed to the CBT centre and pay N700 for registration to a designated account number. He said thereafter applicants should return to the centre with the bank PIN and N700 payment teller to complete registration. Okonkwo said some applicants had, however, failed to follow these guidelines which had caused some delay with their registration. He said the centre was at hand to help some of these students to create an email profile at no cost and referred them to JAMB for issue beyond their control. Okonkwo said the centre had registered no fewer than 1,000 applicants since the registration commenced on Monday. 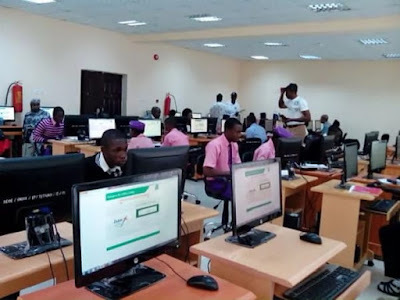 Commenting on the speed of the internet, he described it as very fast, adding that JAMB had provided a dedicated router at the centre which was connected straight to their system. A candidate, Master Ugochukwu Emmanuel, told NAN that the registration was very smooth and he was able to register in five minutes as a result of his previous experience. “I think this year’s registration is easier and more understandable because of the process of registration and people that attended to us made the whole exercise easier,’’ he said. He commended JAMB for the new innovations, saying it was a lot better than last year. In a similar development at another centre, Global Distant Learning Institute, Central Area, Abuja, where the scenario was quite different as NAN observed a slow pace with the registration. Mr Eugune Onyirimba, the Public Relations Officer of the institute, confirmed that the only challenge they had was with the internet connection, which he described as very slow since Monday. According to him, we are able to register about 20 students in one hour; yesterday we were able to register about 350 students and we hope to increase that number as soon as the internet picks up. “As a result of the network issues, we have extended our closing time to 10p.m instead of 5p.m to ensure we register more candidates,’’ he said. Another applicant at the institute, Miss Esther John, said that she was unable to register despite being there since morning. ‘’I came yesterday and could not register; I am here today and I have not been able to register and my number is 104. ‘’I doubt they will get to my number before the end of the day because they are having problems with the internet,” she said.